Breakfast was served on piping hot plates and was very tasty too. Doreen prepared us a very nice packed lunch and we were away by 8.30. 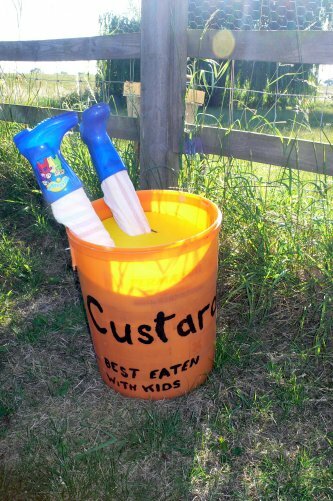 We passed some very strange life sized models of a custard-eating troll as we left the village and never did find out what they were all about. Today promised easy walking with very little ascent. We crossed over the East Coast main railway line and stayed on roads for about 2 miles. 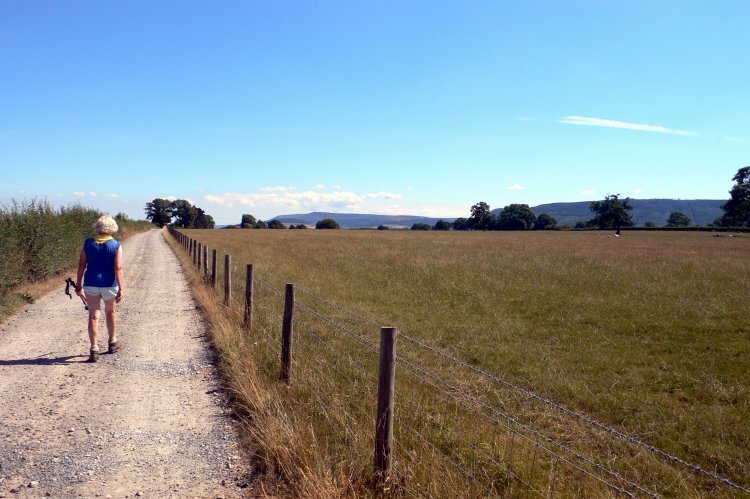 A mix of footpaths, farm access tracks and lanes brought us near to our second railway crossing. On approaching Wray Farm, just before the railway, we encountered a series of A4 laminated cards nailed to low posts at the side of the track. Each card was advertising an enticing aspect of Laura’s Café. Delicious refreshments, filter coffee, dogs welcome, amazingly low prices etc…. By the time we reached the last card displaying the full menu we were hooked. It was only mid-morning but how could we resist such targeted marketing. Rounding the corner we were met by a very dilapidated farmhouse behind which sat two static caravans joined end to end. There was a lovely simple lawn area with 3 tables draped with pretty tablecloths and a collection of odd chairs. 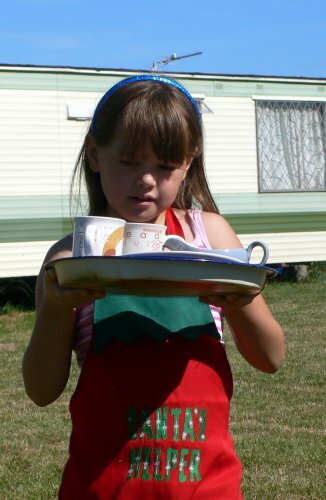 We heard excited voices in the caravan as we took our seats – “….there’s two of them….” A young girl appeared wearing a ‘Santa’s little helper’ apron and carrying a notepad and pen. She explained that her name was Emma and that she was 7 years old but the café was really her sisters business. Her sister, Laura, was feeling unwell so Emma was deputising. (Laura was 12) We ordered 2 coffees and a selection of biscuits, soon Emma brought out a tray of goodies. After a few minutes she returned to ask if everything was ok and stayed to chat for awhile but very professionally she excused herself saying “well I’ll leave you to it” The delightful experience cost us the grand sum of £1.30, we paid and left a £2 tip which raised a beaming smile and some excited chattering when Emma returned to the caravan. Such an enterprising business idea was obviously supported by the parents and Dad came out to explain that he makes all the food and has taken the appropriate food hygiene course to allow him to sell food to the public. We hope they do very well. After our coffee stop we continued our trek across country getting glimpses of the Cleveland hills in the distance as we approached Ingleby Arncliffe. It was getting hotter again and every time we stopped under a tree for a drink of water we got covered in thunder flies, tiny 2mm long insects that didn’t bite but stuck to our skin and were very irritating. 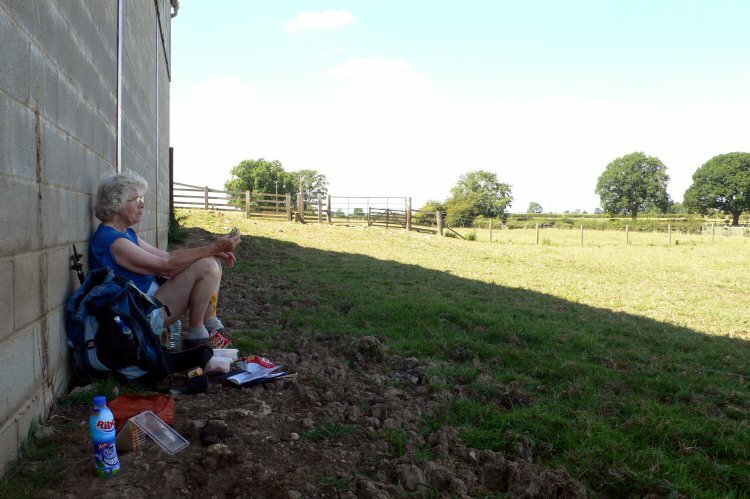 We got to within a mile of our destination but hadn’t eaten our lunch yet; the only shade available was to the side of a very large concrete barn or was it a cow shed? I found half a concrete block for Mum to sit on and I perched on the ground. The barn was at least 60ft long and I managed to lean against the only part that was smeared with cow muck. Luckily it was almost dry and we didn’t notice it until after we had eaten. 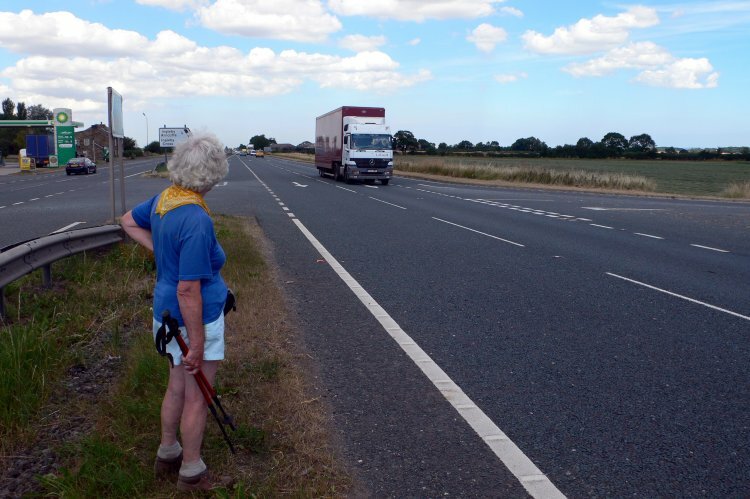 We crossed the final few fields with ease and reached a petrol station on the A19. 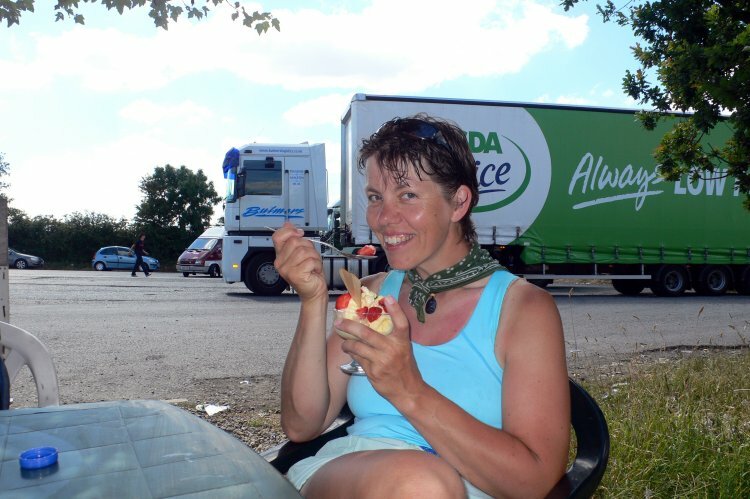 We stopped for ice-cream and strawberries at the truckers’ café behind the station – they were more into quantity than quality but the stop gave us time to muster up the courage to cross the dangerous A19. The road is a very busy dual carriageway on which traffic hurtles along at speeds in excess of 70 mph. We managed the first carriageway fairly easily but waited on the central reservation for ages to cross the second half. Mum doesn’t possess a sprint finish so we had to make absolutely sure that we had enough time to cross. With relief we reached the other side unscathed and within minutes were in Ingleby Arncliffe. The village was dotted with delightful houses, all with well kept pretty gardens. We arrived at Elstavale at 2.30 and were greeted by Josephine who fed us with tea, homemade scones, jam and clotted cream. We were beginning to wish we had given the strawberries and ice cream a miss. Josephine was very chatty and informative. 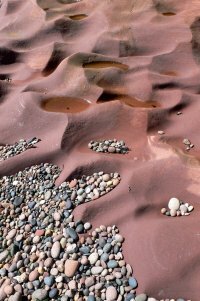 She described parts of tomorrows walk and talked about her exploits with the W.I. We were shown the extensive breakfast menu and then taken to our room in an annex in the garden. It was modern, had cool laminate flooring and crisp white bed linen. We showered, did the washing, tried out the foot spa and lazed about in the garden for the rest of the afternoon. At 6.00 we walked down the hill into Ingleby Cross and into The Blue Bell for supper. The two Dutch lads were there; they had taken a day off in Richmond on Thursday and had walked 23 miles today to catch up. They explained that they wished they hadn’t bothered with a day off as by lunchtime they had seen enough of Richmond and had itchy feet to get going again. The meal at the Blue Bell was very good value – 1 starter, 2 main courses and 5 drinks all for £20. We tried talking to two new C2Cers, 2 ladies from Milton Keynes, also staying at Elstavale, but it was obvious that they preferred their own conversation so we retired for an early night. 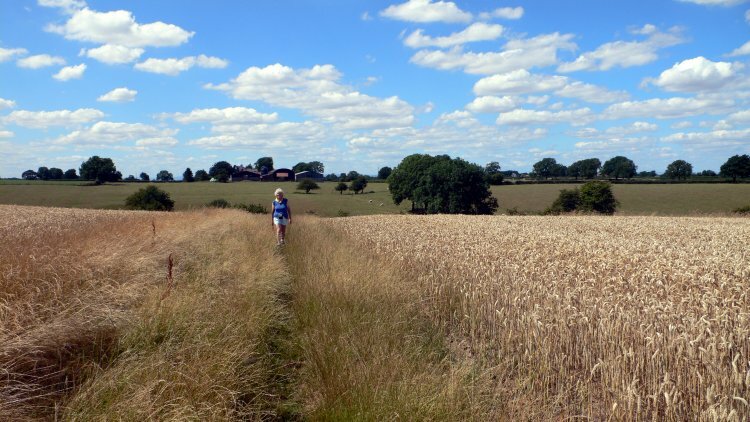 It was still very warm but Josephine had promised that it would be cooler tomorrow – hope she’s right, we’ve got a very hilly 21 miles to cover. Mum – tempted to don my W.I. judges’ hat!! !